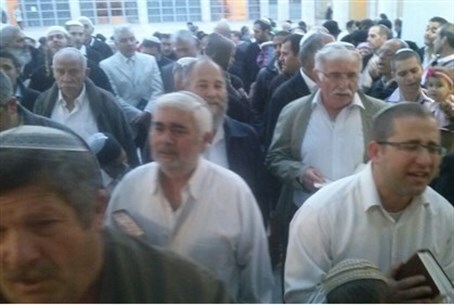 Jews from the community of Ganei Tal in Gaza, who were expelled in the 2005 "Disengagement" plan, last Friday inaugurated their newly built synagogue in Shekem, which is located right next to Kibbutz Hafetz Haim to the east of Ashdod. The entrance to the synagogue at the start of Shabbat was a joyous occasion, accompanied by dancing and singing. 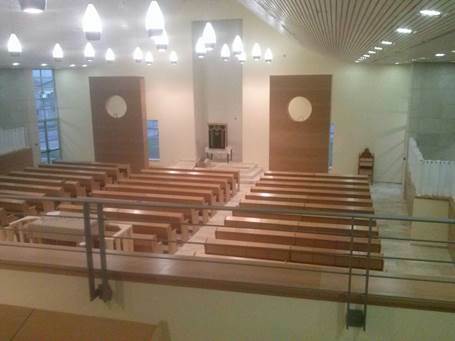 The new synagogue can seat 700, including in the plush women's section. Both on the inside and the outside, the new synagogue's tent-design resembles the community's synagogue in Ganei Tal that was destroyed in 2005. Even the location of the Torah scrolls and holy books has been preserved from the destroyed house of worship. The community's rabbi, Rabbi Aviad Sifroni, gave a talk Friday night during the Shabbat services. "Exactly on this day 10 years ago Ariel Sharon revealed his desire to uproot Gush Katif; after many delays, it so happened that exactly today we enter this lovely synagogue until we will return to Gush Katif," he said. Shlomo Wasserteil, an expelled resident of Ganei Tal who manages the Gush Katif Museum in Jerusalem, told Arutz Sheva, "we merited to enter the synagogue and pray together as one community, in the same places we had in our former synagogue in Gush Katif. We hope that our prayer in the new place of worship will be received by G-d for the sake of all the nation of Israel." "We hope that in the future the synagogues of Gush Katif will return to be built anew," added Wasserteil. "On Friday we all were joyous and moved, after two years of expectations in which we saw the synagogue built, stone by stone. As of last July, 8 years after the "Disengagement," roughly 50% of the nearly 9,500 Jews expelled from Gush Katif remained without permanent housing and suffered from high unemployment rates, as promises to resettle them outside of Gaza were repeatedly broken. Although the homes of Gush Katif residents were bulldozed, the synagogues were not, out of respect for the places of worship. Local Arabs, however, did not show any such respect - torching the synagogues and tearing them down as soon as the last IDF forces withdrew from Gaza.